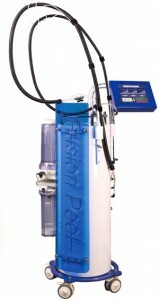 Fusion can be defined as a combination, dissolving and hybrid process stage. 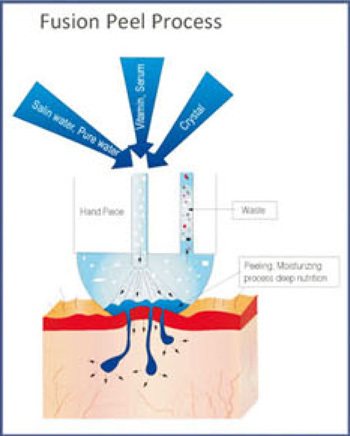 The FP-8 fusions the elements of crystals, vitamins as well as saline water and lotion. Fusion peel allows the patient to achieve a much deeper and a more even abrasion process . A mixture of vitamin is injected into the skin acting as a first aid kit causing the wounded area to heal at a greater speed with minimum pain. Alternative saline water and cosmetic lotions act as a sterilizing process to the skin while maintaining it’s peak moisturizing percentage. One of the most popular non-invasive procedures that uses electrical devices to dramatically improve the skin. Precise application of skin-exfoliating particles diminishes the appearance of fine lines and wrinkles, improves aging skin, treats acne-blemished and sun-damaged skin, refines pores and reduces scars. Includes neck and decollate. 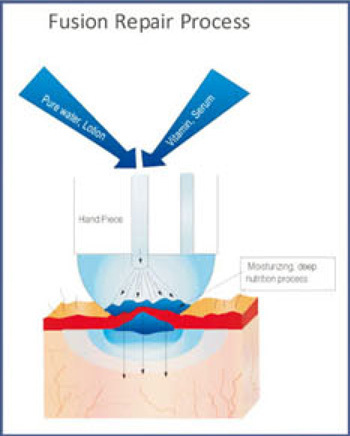 Microderm Treatment: Maybe added as an upgrade to any facial therapies.